We became involved early on, offering a home for these cats. With an ill wife and disabled son at home, Salton faced six months in jail if he lost his appeals. After years of litigation, he finally accepted a plea bargain, agreeing to place the cats elsewhere within a year. I wanted to take a moment to share what we’ve been going through with Shadow. We’ve noticed she’s been under the weather, acting a bit off. This girl is so strong and resilient, we didn’t know just how serious her condition actually was. But, at 16, we always like to be extra cautious if we notice anything at all unusual. A few days ago, she was very lethargic and our vet came on site to sedate her for an exam and proceed with spaying her. Unfortunately, she found a large mass in Shadow’s uterus that was causing an infection throughout her body. Shadow was rushed into emergency surgery with specialists to remove the mass. We’re still waiting on the results of the biopsy. Since then, Shadow has undergone an ultrasound and second surgery to help fight the infection caused by the mass. She’s currently receiving round-the-clock care by our staff and trained veterinarian technicians. Shadow is a real fighter and experts think it’s worth fighting her infection the next few days to see if she can make it through. So, that’s what we’re committed to doing. She’s stable, but also has a guarded prognosis. We’re surrounding her with love, support and the medical attention she needs. She means everything to us. We always appreciate the outpouring of support, but at this important time, we want our focus to be on Shadow when she needs us most. We’ll share more publicly when we have more information. But we wanted you to know, because you’re part of her extended family. Her medical bills have already topped $5,000. Your support enables us to perform these very expensive emergency procedures, giving us a good chance at saving her life. For that, I’m so grateful. I know she means as much to you as she does to me and everyone at the sanctuary. When Shadow stopped engaging and was notably lethargic, we knew something was wrong. Shadow arrived at our sanctuary when she was almost 15 years old. Upon arrival, she was being treated for chronic UTI’s and a biopsy performed on several skin masses. Due to her age and medical conditions, Shadow was added to a short list of female cats that we chose not to spay upon intake. Only 6 of our 112 residents are not spayed, and that included Shadow. These decisions are made based on medical conditions, age, personality and how they would do in a confined space during recovery, as well as several other behavioral factors. 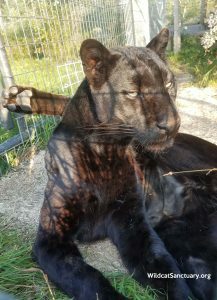 Once Shadow’s UTI’s were under control, and the mass biopsy was benign, Shadow was added back to our list of cats to be spayed during her next routine exam. Sadly, we were unaware of the tumor growing inside. 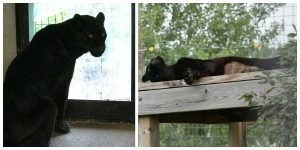 Shadow has received critical care and is making progress. The biopsy results came back benign, which is great news. 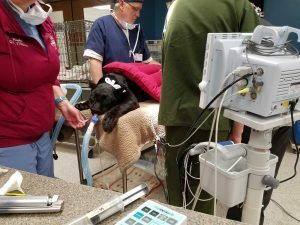 After two emergency surgeries, she’s received 24/7 care, including three antibiotics and IV fluids twice a day. 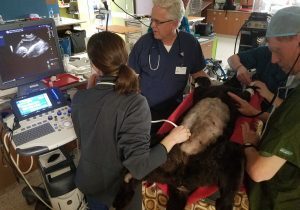 Skilled veterinarians and technicians have donated their time to be onsite at TWS twice a day to work alongside our staff to administer these treatments. Recently, the catheters were removed and Shadow is now drinking on her own. She is standing, rubbing and grooming herself. All great signs of recovery. Now we need to encourage her to begin eating on her own. She will continue to receive antibiotics for several weeks and may also need more supportive fluids. We are cautiously optimistic, but this strong girl is heading in the right direction. We cannot thank you enough for your outpouring of love and support. It’s kept us and Shadow going! And thank you to all the vet care staff who have donated their time to her recovery so far. And without a doubt, thank you to the special donors who’ve helped cover the cost of her two emergency surgeries! Shadow owes her life to each and every one of you!! We know waiting for news on Shadow is difficult. The waiting is hard on us, too. But sometimes, time is what’s needed to see what the future holds. Shadow continues to amaze us. She’s such a resilient and happy leopard. At 16, she’s already cleared two large hurdles. First, the emergency surgery to remove the uterine tumor and second the ability to fight off a very serious infection. Now she still has one more hurdle. Her kidneys are not working as they should. And we were hoping with supportive care, her body could compensate and begin taking over. So far, that hasn’t happened as we’d hoped. Going into surgery, her kidneys were a little compromised due to age. Then, her kidneys had to work overtime to clean the toxins from the infection from her body. 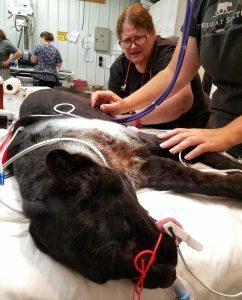 After surgery and during recovery, she was receiving IV and subq fluids and she was urinating. It was time to stop the treatments and see how she could do on her own. Right away, Shadow was social, rubbing, playing and very happy to see her human friends. She’s still that way this morning. But the reality is, Shadow isn’t eating well. She’s drinking, but urinating a large amount. Her last lab results confirmed her kidneys are not doing what they should. 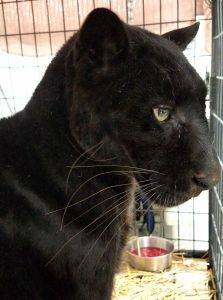 The vet team and staff had have several meetings to discuss Shadow’s needs and what is best for her. 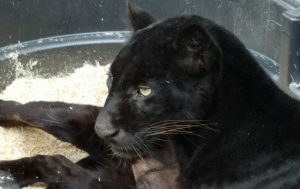 Our decision was to release her back into her habitat and modified yard where she can enjoy the sun she loves so much. This would also give her body a few days to see if things would begin to work properly on her own when she’s in her familiar space. Each moment we’re hopeful, but we’re sadly also facing the reality that Shadow may only be with us a short time. The thought of that breaks our hearts. But at the same time, to see her bound up to the fence and rub, just to say hello, fills our hearts with joy. Her personality is so contagious, and she’s always the one that wants to cheer us up. What a very special girl she is. We are cherishing these moments, still holding out hope that she will beat the odds. The vets and staff are monitoring her closely to ensure she’s happy and comfortable – which she is. She’s getting spoiled with every kind of food and treat she could want. She’s scratching on her favorite logs, napping in her favorite trough bed and still telling Daisy who is boss at the fence. We know she will tell us if it’s time to let go or if she can beat the odds. But until then, we’re so glad to have Shadow back for however long that may be.